A veteran reporter ought to know better than to say such a thing. But a post last week about 186 Spring Street — a 19th-century row house near Thompson Street that seems destined to be demolished or (far less likely) made a landmark — all but stated flat out that nothing of consequence had occurred there until it was bought by a Beastie Boy in 2000. 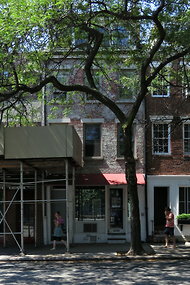 In fact, 186 Spring Street had a brief turn as a center of gay political activism in the decade following the Stonewall uprising, when it was the home of at least three gay rights leaders: James W. Owles, who died of AIDS in 1993 at 46; Dr. Bruce Voeller, who died of AIDS in 1994 at 59; and Arnie Kantrowitz, who is now 71. Andrew Berman, the executive director of the Greenwich Village Society for Historic Preservation, brought the information to my attention. (A canny strategist as well as a passionate one, Mr. Berman knew that I’d written Mr. Owles’s obituary.) 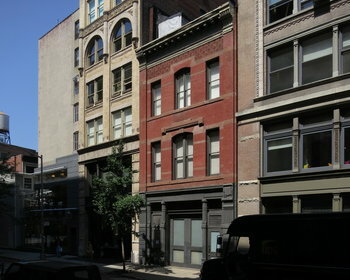 He is pushing hard for the Landmarks Preservation Commission to create a South Village Historic District, including 186 Spring Street, or at least designating the individual building a landmark to make it harder to tear it down. As part of that effort, Mr. Berman spoke with Mr. Kantrowitz. He told me that when he lived at 186 Spring in the early ’70s, it was basically — amazingly — still a single-family house, used as a gay commune in which he, Jim Owles, Bruce Voeller and three or four others lived in individual rooms but with communal responsibility for food, chores, et cetera. The house often functioned as a communal space for discussions around the activist issues of the time. “Everything happened out of that house,” recalled Allen Roskoff, a longtime political operative who was Mr. Owles’s partner in those days and is now the president of the Jim Owles Liberal Democratic Club. Mr. Roskoff remembered a country-style kitchen organized around a butcher-block table and a den on the top floor with a swinging chair suspended from the ceiling. David W. Dunlap/The New York TimesThe Gay Activists Alliance opened a center in this former firehouse at 99 Wooster Street in 1971. Mr. Owles, the president, lived nearby. Gay ActivistMr. 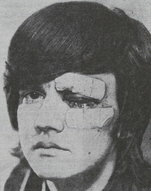 Owles was injured in a 1972 “zap” at the Hilton. Mr. Owles was arrested any number of times. In an especially memorable 1972 zap of the annual Inner Circle dinner of City Hall reporters and civic leaders, he was punched in the eye, kicked into unconsciousness and tossed down an escalator at the Hilton New York by men in dinner jackets. He had moved in with Mr. Roskoff at 212 Sullivan Street by the time he ran for City Council in 1973, the first openly gay candidate to do so. Carol Greitzer, the incumbent, beat him handily in the Democratic primary. Dr. Voeller, a co-founder in 1973 of the National Gay Task Force Foundation (now the National Gay and Lesbian Task Force) lived in the house at least until the early 1980s with his partner, Richard Lucik. At 186 Spring Street, Dr. Voeller established the Mariposa Education and Research Foundation, whose special focus was reducing the risk of sexually transmitted disease. David W. Dunlap/The New York Times186 Spring Street. “SoHo at that time was a lot of old buildings in disrepair,” said Jeff Soref, who was Mr. Green’s press secretary and a co-sponsor of the party. “There were a handful of pioneering art galleries but not much street life, even in the early evening, when we headed downtown for the fund-raiser. In those days, SoHo was still a pretty exotic destination. I remember going down there occasionally to a gay-ish supper club called the Ballroom,” on West Broadway. 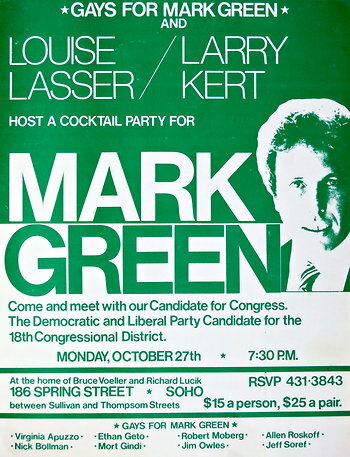 Mr. Green had a long political career ahead of him in 1980, including two terms as public advocate, and hundreds of fund-raising events — as well as a date with an orthodontist. But he said this week that he could still bring that evening at 186 Spring into focus. Courtesy of Allen RoskoffPoster for a 1980 fund-raising party at 186 Spring Street. Do all of these associations and memories mean 186 Spring Street qualifies for landmark designation? That’s a much harder argument to make, since there is so little left of the building’s structural and aesthetic integrity, and since a demolition application is already on file.